Ready to punch above your weight with the big boys? 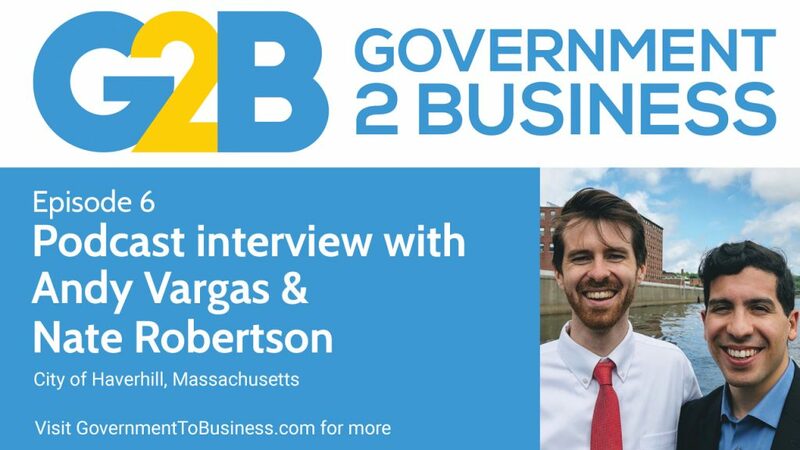 In this interview Massachusetts State Representative Andy Vargas and the City of Haverhill's Assistant Economic Development Director Nate Robertson outline how a mid-size city can achieve great things in the digital service delivery space with business customers. We talk about how government can create a personal connectedness with business owners, doing a lot with very little resources and the importance of mentoring as an economic development tool. Visit Haverhill's Business Portal to learn more. Gavin: G'day folks welcome to Government to Business. Today, I have a short sharp and to the point, but geez a rather value-bomb impactful interview today with Andy Vargas, who is the state representative within Massachusetts, the actual the State House in Massachusetts in the United States, and also with Nate Robertson who is the Assistant Economic Development Director within Haverhill, a municipal local council in Massachusetts. Haverhill is one of those cities which is, you know, not massive in the sense of like a New York or a Los Angeles but it's not a small little, you know, barely a city type of arrangement either. So if you run a municipal government or a local council anywhere around the world there's some really excellent learnings from these guys around how a local government can bring together an entrepreneurial minded business folks within the city how they can attract people from all around the state and potentially nationally who want to relocate and relocate in a more business friendly environment. They talk a lot around creating a platform to encourage and incentivize investors and entrepreneurs to move to the city. And really kind of creating that whole destination where an entrepreneur or business owner goes, "Look, I'm looking for somewhere that's business friendly, I'm interested in a location that's actually going to help me grow my business even further." And if you are thinking about doing that you have to listen to these two gentlemen. As I said before, it's a short, sharp interview. Both Andy and Nate when I recorded this with them, it was probably pretty late in the evening. Actually in Massachusetts time after they've already had about eight meetings during the day and I think they were about to scoot off right after the interview for another meeting. We kind of cover off the personal approach that's adopted within Haverhill, the concept of - and some of us do this already - begging forgiveness at a later date rather than actually, kind of, going for permission and the importance of mentoring and how mentoring can make a significant impact to local businesses and to encourage that growth within a particular location. So a lot of incredible insights that you can learn and then apply to your own government's business portal and the digital approach to business. So sit back and enjoy this insightful impactful interview with Andy Vargas and Nate Robertson. Gavin: Thank you very much for your time today guys, I'd like to welcome Andy and Nate through to the show. We're going to talk a little bit today around the Haverhill business portal and that's obviously something that you've both been, you know, integrally involved in at various points of time. Could you tell me just a little bit and share with our audience about what the vision is for that particular business portal and how you were involved in that process? Andy: Sure. Nate: Yeah sure thing. So the idea was, and I'm sure you are familiar with this Gavin as well as I, when you go to a municipal website, it's usually not very user friendly. The updates are sporadic at best. They tend to be clunky and outdated. And they're just not, they're not conducive to people who have busy schedules, people with small businesses, people who are trying to navigate that stuff. So the idea was here in Haverhill we're really trying to incubate small businesses. We're really trying to bring together entrepreneurially minded folks and get them in the city, opening up space whether it's retail locations or industrial parks and get them involved in the city. So to do that we really needed a platform that allowed them to navigate the world of business incentives, whether that's you know, a real estate tax abatements or whether that's workforce training grants. Get them to more easily navigate the world of permitting if they are a food establishment. What permits do they need to get? Who do they need to go to? What time are those people in their offices? What phone numbers do they have? Really simple stuff. But I wanted to put that all in one location so I could just point - even just today I had a meeting with a business moving to Haverhill and she said, "Here's what my timeline was looking like so I'd love to get you know, set up like that." And she's not thinking, occupant paper. She's not thinking, the red tape about it all, she's just thinking from her business perspective. So I was like, "Well here's what you should do: get in touch with the folks over at City Hall so we know what your schedule is and we can help work with you." And I gave her the website address HaverhillBusinessPortal.com and and she was like, "Wow, this is perfect." It was all the information she needed at her fingertips. She didn't need to go digging for it. She didn't need to start calling people at 7:30 at night asking who to talk to. It was all they're ready for her. Andy: Yeah, I think you know, the only thing that I'll add is that you know, there's sort of two prongs to our vision for this, right? One is how can we be helpful to the business community? Whether that's the business community that exists here. Or the business community that's looking to move here. Or the resident here that is an entrepreneur and need some assistance in figuring out how do I start my business in the City of Haverhill? So that's sort of one prong and ensuring that information is available to them. Sort of the tier two goal also is that it creates a narrative that Haverhill is forward-thinking, right? That Haverhill is thinking about ways to support the business community that midsize cities similar to us aren't, right? And so we're 65,000 people. We are not a Boston. We're not a New York. We're not, you know a very large city. But it's still important to us to be able to stick out amongst those midsize cities as a thought leader when it comes to engaging with the business community and thinking about innovative ways to address their pain points. Gavin: Okay, that makes perfect sense. I mean obviously being a mid-sized city that's got its own set of challenges as well. But it's also a whole heap of opportunities there. I mean one thing that really I suppose I was intrigued with and was delighted to kind of see was that real sense of community that you actually get through from the portal, you know, so many understandably large government business portals tend to be very much based around providing the transactional services, providing the information and just, you know, doing everything as best as you can within that digital space and digital space only because it takes too much resources otherwise. You're obviously in a very, very different boat though because you are providing that real personal connectedness throughout the site, you know. There's not only the videos from a number of the city officials there, you know, they're personally saying, "Hey, if you've got a problem, give me a call. And here's my telephone number and here's my email address." I mean even the mayor's on the site obviously doing exactly the same type of thing. So, what was the rationale behind taking that personal approach on the site? Andy: Yes, I think you know, one of the most important things that we heard from small businesses here in the City of Haverhill, but also in general that just the business community across the state is that, in general government is tough to navigate, right? We don't know where to go, who to talk to, who are the folks on the other end. A lot of times I've called City Hall and I get you know, bounced around to different departments. So for us it was important to sort of put a face, you know, to the name. Put a face to the phone number. And make it feel as personal as possible, that we were there ready to serve. And so I think you know, that has been helpful when folks visit the website instead of just calling a general city hall number. They now have the background of oh, I'm calling you know, City Clerk Linda Koutoulas who has this video message and I'm calling this number directly to get my question answered immediately. Nate: I also think it's just a so much more of a humanizing element. I know the folks who work at City Hall are some of the most hard-working folks that I know and they're so knowledgeable and they have so much experience and it's tough to communicate that in the block of text. So it's, I think it's humanizing. It's a way to communicate; this is Linda. This is who the face of the person you're gonna be talking to is and she's gonna walk you through some of that stuff now. And suddenly it's not this big sterile block of text that's looking at you in the face, it's Linda the city clerk who is gonna greet you when you walk into the door and it's a more human element. It's a less scary element. And I also think ultimately it's a more helpful element. Gavin: Have you got any early feedback from businesses around it and how it connects to the city? Nate: Absolutely. I've used it, like I said I used it today with a business who's relocated and they absolutely loved it. I've used it probably with three or four small businesses who are either already located in the city and had questions or relocating to the city and had questions and I've gotten positive feedback from all of them. What's really great about the website is our competition isn't too tough. creating a reputation for being business friendly. Gavin: And I'm kind of thinking at the same time, that's quite a challenge, you know, it makes a lot of common sense to be delivering that type of experience for businesses and you know, to get them to start, to get them to move to the city and so forth. But obviously a lot of governments whether you're talking municipal, state, federal, you know, there's a lot of bureaucracy there and there's a lot of people who are looking after their own little patches so to speak and you know, looking after that. integrated experience for the customer? Andy: Yes I think sort of related to your point on navigating the bureaucracy and actually, you know, making this happen. One of the things that I think was key was the fact that we just kind of set off and did it, right? We didn't wait for money to be allocated for us to do this. I was a city councillor at the time and so I said, "Look, there are so many platforms out there that we can use to build beautiful websites without writing a single line of code, right?" And so as a city councilor I embarked on this journey of engaging with different stakeholders: so the chamber of commerce and the local broadcast cable station here, HC Media who did all the videos, the state agency that works on economic development and I just said, "Hey, I'm building, you know, I'm starting to work on this website and it's not gonna cost us anything because I'm paying to host it right now. It's like ten dollars a month. And it's you know, within a month we're probably gonna, you know, set the course to build a website that will look better, that will definitely look better than the entire city website." Then ultimately I handed the keys to this guy and who built what we see today. So I think an important part of this is recognizing that you know, if you're in municipal government right now or in state government right now, where we are today with technology is it really democratizes this space, right? It makes it more accessible for anybody to build solutions for the business community on their own and then you know, once you have something tangible that you can touch, that you can see, that you can present, I think that's where you could really add some value and then scale as we did with Nate taking the keys and running with it. Nate: Yeah, and I want to echo Andy's point, and I know he didn't say it quite like this, but I think there's a certain value in doing something first and then asking for forgiveness and more funding later. Because once you show somebody like, this is what we could have, it's gonna go away in a month unless we continue to focus on it or allocate some money towards it. Nate: Then people go "Oh no, this this makes a lot of sense. We want this." And, with the amount of technology we have at our fingertips, we'd be, it's it's often the best strategy. Andy: That's an excellent point. Gavin: No, I totally agree with you, where do you see things going from here though? I mean as you said its only in its first months of infancy, where are the opportunities for its development to you know, continue to build on that experience for businesses? Nate: Gavin I gotta say I really liked the write-up you did on the Business Portal and I appreciate... I know, I mean, maybe I'm a geek about this stuff, but I read it and I was like, "Okay, this is a guy who get's it, probably more than I do." I mean, I think the points that you brought up were really valid it and I think pointed to roadmap going forward which is we have this great kind of landing page. How do we better integrate it into the municipal website? How do we declutter the municipal website? The main, you know, the City of Haverhill page and integrate our business - our new shiny business portal - into it? And how do we keep that updated? How do we continue, you know, putting news articles? How do we continue maybe linking up a social media page with like a Facebook or Twitter and making it more of a living page? But I really appreciated your article as as a point of praise but also as a kind of a road map in terms of the direction going forward. Andy: Yeah I think the next point is, you know, we've built something great. Now, let's get it in front of people right? So as Nate mentioned, you know, it's a social media campaign, it's looking at how we can use Google Ads, it's, and it's also thinking about how we can grow the content that's on there. So I think one of the things that we can grow in is in the amount of mentors that we have on the page, right? Right now we have I think three or four? Andy: That are there and ready to you know, mentor folks who are interested in starting a business in Haverhill, but as we start to have more demand in that I think it would be interesting to expand that very valuable resource on the website. Gavin: Excellent. I was actually going to ask a little bit around the mentors and your approach to you know, attracting them and you know, what's in it - not so much what's in it for them to participate - but you know, how do you kind of create that connection within the business community for them to participate or just to start thinking about the ideas, do you, I mean this is totally going offline, off normal digital strategy, but that's the nature of what you need to do. You need to get your processes right first. I mean, how do you approach that? And where are your thoughts on where you see that going? Andy: Yeah, so the the job that I had while being a city councilor was I was a senior marketing manager for an organization called Entrepreneurship For All, and what EforAll is, an organization that empowers entrepreneurs of all backgrounds and what we found is that you know, we empower them by classes, by small grant money, but the real meat of it is the mentorship, right? And so each of the entrepreneurs that went through that program would get three mentors. And so those three mentors would guide the entrepreneurs through launching their business not only for the first year but really stay with them for life, really. And you know over the course of the last four and a half years EforAll all has created 431 jobs through the entrepreneurs that came to our program, right? And so learning from that experience and understanding how important and powerful mentorship is we decided to at least list some of the folks who are willing to step up and say, "Hey, I'm going to give an hour or two or maybe even more depending on how viable the business is and how impactful I can be to the business." And so we tapped into our personal networks and just asked, "Would you be willing to meet with the individuals that might seek your mentorship?" And, I think that's one of things we'll have to think about moving forward is how do we scale that? Nate: Yeah, and I think what's great about the mentorship program is that it, really communicates the strength of operating in a small community. I don't have to give these folks anything. These were all people who are really passionate about their businesses, but also passionate about small business in general. I mean you have to be if you're a small business operator or else you really won't succeed. So I remember sitting there and I'm talking about my business mentor Paul, and I mean I eat at his restaurant probably once a week and so I'm sitting there and I was like, "Hey Paul," I mean this is a young guy who dropped out of culinary school because he had the grit and the go-get-'em attitude to start his own business. He was ready to do it. And he did it and I was like, "How would you feel about like, helping other small businesses?" 'Cause this guy's are wealth of knowledge, "I mean just to share your experience and to, you know, be a backboard for new companies?" Which he was like, "That sounds great, I would love to do that." And so really this stuff was just giving a platform to people who were looking for a way to give back and just didn't know how to. So it was really an easy thing to do and I agree I think 3 is a good start, but I would love to see that number grow to 6, and then maybe get them together and do some sort of speaking event or you know, a small business how-to kind of thing. I think there's a lot of room for growth there. Gavin: I can see that at the moment there's obviously someone in the background saying "Hey, we need you guys to wrap up soon." And that's cool. You've been incredibly generous with your time. I'd actually really love an opportunity to go into a bit more detail maybe another six months or so down the track and see where you've taken things from there. That would be really great. I guess Andy the one thing I just want to ask you coming towards the end, making the transition from city government into state government, where do you see the opportunities going at the state government level with what you've learned and developed at the city level? Andy: Sure, I think you know, a lot of the same principles apply, right? I mean the state government website recently, the front door of the state government website recently was revamped and it looks great. But when you click on a lot of those links that go off to pretty old websites. And so I think you know, especially being in Massachusetts, right? We're talking about an innovation state, we have sort of a responsibility to live up to that reputation. But also to make, you know, our websites more accessible whether it's for the business community or disabilities community, those are all things that you know, we should be prioritizing there. Obviously it's a little bit less <inaudible> on the city side, right? So there's, sort of more bureaucracy that I have to go through and I can't just go ahead and build a state website, right? Gavin: Not for $10 a month. Andy: Right. But there are still, you know opportunities whether it's you know building a website that better highlights what grant opportunities are available for businesses, right, in the state of Massachusetts. So you're not sifting through an Excel spreadsheet and instead you're looking at you know, a map of the state that highlights what you know, opportunities are based off of, region or by, you know, industry area or by you know, stage. Gavin: I think California just recently relaunched one of the their business grant sites. So it's probably worth having a look at. Ändy: Exactly. There you go. Gavin: There's a wonderful thing about America, you've got 50 states and goodness knows how many city governments, so you can all kind of learn from each other pretty quickly. Nate: Yeah, I mean and there's a, I'm sure you know, there's a lot of examples of great city governments, and there's a lot of examples of not so great city government web sites. So yeah, there's a wealth of options to kind of sift through. Gavin: No worries. Look, thank you very much and wrap things up now. I know you need to go to your next meeting gentlemen. Andy Vargas, Nate Robertson, thank you so much for your time today and I'd love to have you back at a later date to find out how things have gone in the future. Nate: Yeah, Gavin. Thank you for your passion around this and I love it and I look forward to talking to you. 0 Comments on "Podcast episode 6: Interview with Andy Vargas & Nate Robertson on the Haverhill Business Portal"